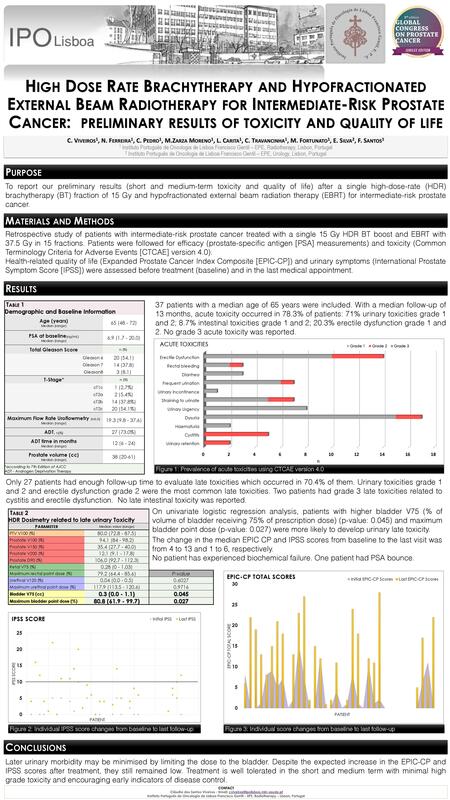 Purpose: To report our preliminary results (short and medium-term toxicity and quality of life) after a single high-dose-rate (HDR) brachytherapy (BT) fraction of 15 Gy and hypofractionated external beam radiation therapy (EBRT) for intermediate-risk prostate cancer. 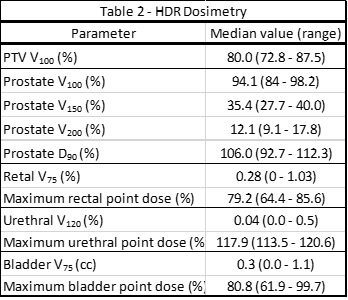 Materials and Methods: Retrospective study of patients with intermediate-risk prostate cancer treated with a single 15 Gy HDR BT boost and EBRT with 37.5 Gy in 15 fractions. Patients were followed for efficacy (prostate-specific antigen [PSA] measurements) and toxicity (Common Terminology Criteria for Adverse Events [CTCAE] version 4.0). Health-related quality of life (Expanded Prostate Cancer Index Composite [EPIC-CP]) and urinary symptoms (International Prostate Symptom Score [IPSS]) were assessed before treatment (baseline) and in the last medical appointment. Results: 37 patients with a median age of 65 years were included. With a median follow-up of 13 months, acute toxicity occurred in 78.3% of patients: 71% urinary toxicities grade 1 and 2; 8.7% intestinal toxicities grade 1 and 2; 20.3% erectile dysfunction grade 1 and 2. 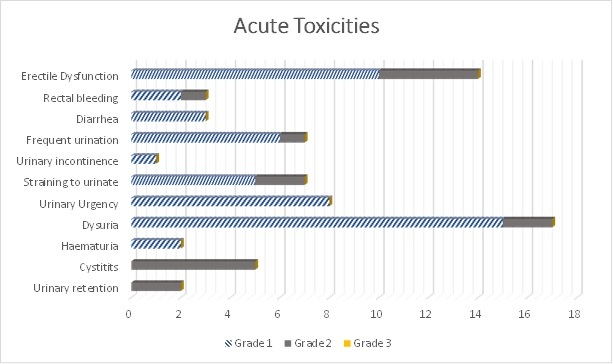 No grade 3 acute toxicity was reported. Only 27 patients had enough follow-up time to evaluate late toxicities which occurred in 70.4% of them. Urinary toxicities grade 1 and 2 and erectile dysfunction grade 2 were the most common late toxicities. Two patients had grade 3 late toxicities related to cystitis and erectile dysfunction. No late intestinal toxicity was reported. 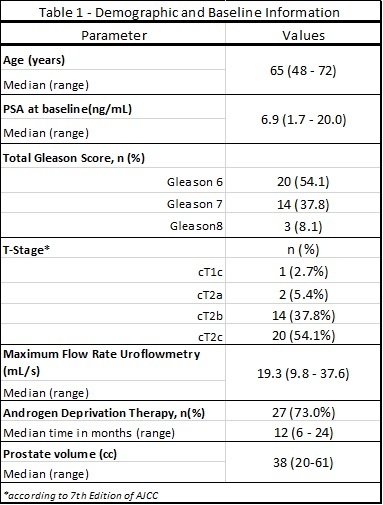 On univariate logistic regression analysis, patients with higher bladder V75 (% of volume of bladder receiving 75% of prescription dose) (p-value: 0.045) and maximum bladder point dose (p-value: 0.027) were more likely to develop urinary late toxicity. The change in the median EPIC CP and IPSS scores from baseline to the last visit was from 4 to 13 and 1 to 6, respectively. No patient has experienced biochemical failure. One patient had PSA bounce. Conclusions: Late urinary morbidity may be minimised by limiting the dose to the bladder. Despite the expected increase in the EPIC-CP and IPSS scores after treatment, they still remained low. Treatment is well tolerated in the short and medium term with minimal high grade toxicity and encouraging early indicators of disease control.